UN Middle East envoy Nickolay Mladenov said he was “deeply alarmed”. “Our collective efforts have prevented the situation from exploding until now. If the current escalation however is not contained immediately, the situation can rapidly deteriorate with devastating consequences for all people,” he warned. Hamas’s military wing said it was behind the rocket attacks. 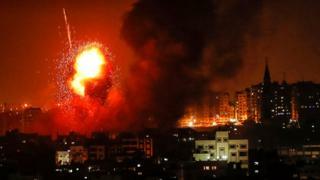 Earlier this week two of its militants were killed after Israel shelled a Hamas border post in northern Gaza. The Israel Defense Forces Twitter account said its fighter jets had targeted more than 140 strategic sites, including a weapons manufacturing and storage facility. “The Israeli strike was conducted in response to the rockets launched from the Gaza Strip at Israeli territory over the course of the evening and night,” it said. Israeli television broadcast images of damage to homes and cars in the town of Sderot. The cross-border violence comes soon after a delegation of senior Hamas officials visited Gaza to discuss a ceasefire agreement with Israel proposed by Egypt and the UN. On Wednesday, UN Middle East envoy Nickolay Mladenov condemned the Hamas rocket fire and called for both sides to step away from the brink.